"...I want to say "Thank You" for creating and running AmmoGuide.com for so many years. I know it's been a fairly invaluable resource for shooting enthusiasts all across the world..."
We apologize for any inconvenience but PLEASE DO NOT REPLY TO THIS EMAIL. To unsubscribe from AmmoGuide News, click here. This month, AmmoGuide shines with new case diagram features and documentation to explain them. Also, guess who's been defending your rights when you weren't looking? On July 26, 2008 at the Annual NRA Members' Councils of California Conference (this year in Anaheim, California), AmmoGuide author Mike Haas received the 2008 NRA Members' Councils of California Volunteer of the Year Award "In recognition of outstanding accomplishments, dedication and loyalty to the National Rifle Association and the NRA Members' Councils Program." In attendance were NRA Executive Vice-President Wayne LaPierre, NRA Board of Directors Members Tom Gaines, Manny Fernandez, and Joel Friedman, NRA-ILA California State Liaison Ed Worley and NRA Liaison to the Executive Vice President/MC Program Administrator H. Paul Payne. 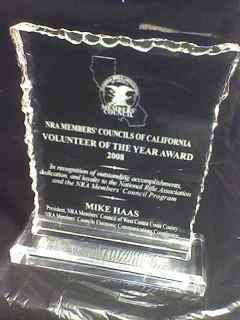 Mr. Payne presented the award to Mike in front of an audience of hundreds of California NRA members and volunteers (who responded with a standing ovation). The NRA Members' Councils of California has been an official program of the NRA for nearly 20 years. The program consumes no NRA resources but is 100% supported and run by NRA members. Over 20 NRA Members' Councils hold monthly meetings across the Golden State, giving NRA members the ability to engage in the battle to defend their rights by joining NRA's "Army on the Ground". Mike has served as President of the NRA Members' Council of West Contra Costa County and the NRA Members' Councils Electronics Communications Coordinator for over a decade. He designed the state website - CalNRA.com - including the site's Legislative Information and Contact Tools System. He also donates and maintains public and internal communications resources that form the backbone of the state group's ability to support NRA's efforts in Sacramento. ...plus internal changes that will support additional funtionality in the future. Now more than ever, AmmoGuide has a Case Diagram for EVERY round. A new article - 'About AmmoGuide Case Diagrams' - has been added to the AmmoGuide "Articles" section (when logged in, it's under the "Information" menu). It helps explain both general and AmmoGuide-specific diagramming concepts. You can also find a link to 'About AmmoGuide Case Diagrams' on every Detailed Cartridge Information page (just above the displayed case diagram, as shown on the right). Many thanks to subscriber tloc54 who collaborated with AmmoGuide author Mike Haas to create this new resource. His in-depth knowledge of dimensional languages was a huge asset and is a fine example of the AmmoGuide community in action. Verification Against SAAMI Database - We have continued verification of AmmoGuide rounds against the SAAMI database as time permits. This month, these cartridges join those already verified. Watch for more to appear soon! Support for Blackpowder - We haven't forgotten about this task, it's just that we've been swamped getting the Case Diagram Enhancements finished. On top of that, our key blackpowder support subscriber has been on vacation. But the stars are starting to align for this exciting new project and - we think BP is a direction that is perfect for AmmoGuide. Stay tuned! NOTE: Even non-members can submit new cartridges with the AmmoGuide Cartridge Creator, as submissions are vetted by AmmoGuide staff. However, only paid subscribers may submit new loads, as they are published immediately on the website.